Amitai Sandy (29), graphic artist and publisher of Dimona Comix Publishing, from Tel-Aviv, Israel, has followed the unfolding of the “Muhammad cartoon-gate” events in amazement, until finally he came up with the right answer to all this insanity - and so he announced today the launch of a new anti-Semitic cartoons contest - this time drawn by Jews themselves! The contest has been announced today on the www.boomka.org website, and the initiator accept submissions of cartoons, caricatures and short comic strips from people all over the world. The deadline is Sunday March 5, and the best works will be displayed in an Exhibition in Tel-Aviv, Israel. Sandy is now in the process of arranging sponsorships of large organizations, and promises lucrative prizes for the winners, including of course the famous Matzo-bread baked with the blood of Christian children. 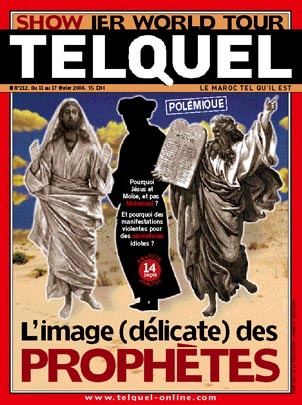 The headline says "The (sensitive) image of the prophets" while the text in the blacked-out Mohammed says "Why Jesus and Moses but not Mohammed? And why violent demonstrations because of idiotic cartoons?"